Teammates typically watch out for one another, but on one dragon boat team, some members literally act as the eyes for their fellow paddlers. 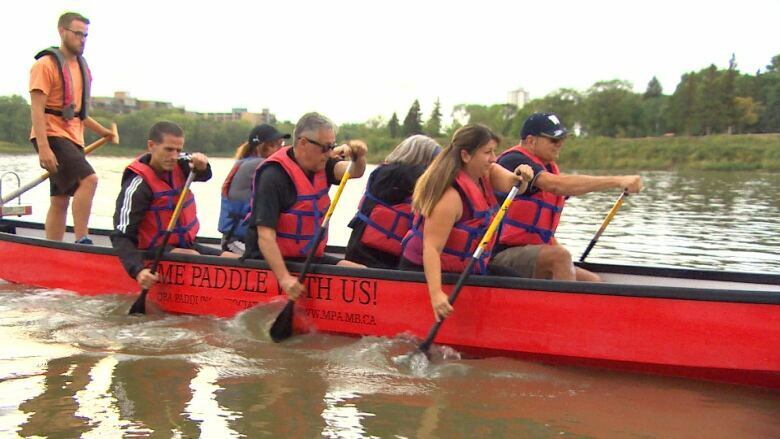 Paul Nicolas is the president of Manitoba Blind Sports Association and a member of the No-See-Ems, a dragon boat crew made up of four people with vision impairment, each paired with a spotter. His daughter, Bryana Nicolas, is his spotter on the team. "It's a lot of fun, it brings us closer together, we get to do a little bit of competition together so it's a lot of fun," he said. The eight-person crew will compete this weekend in the September Dragon Boat Challenge. The team has been practising once a week since the end of June, and Paul says his team is ready to compete against the other teams, some of which have only practised a couple times. "We don't want to tell them that yet, but we might have a small edge," said Paul. 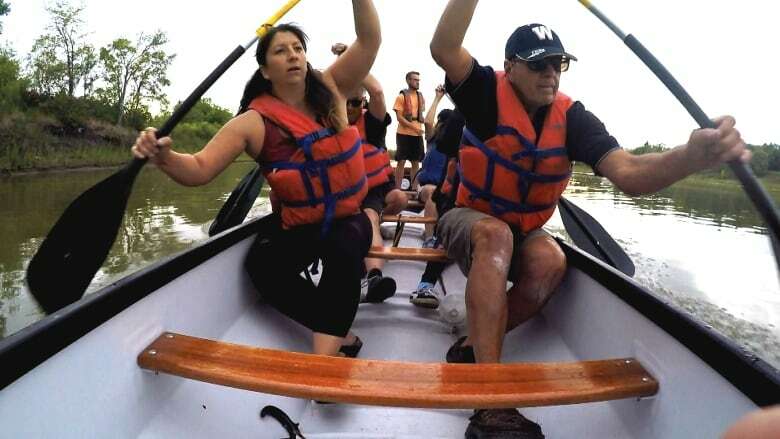 At first, Paul and the other visually impaired team members needed help to guide their paddles into the water, but after many weeks on the water, they are all on more equal footing, said Bryana. "He's telling me I'm doing things wrong, and I'm telling him he's doing things wrong. So it's good, it's fun," she said. Bryana and Paul have gone canoeing together, but she said learning the different paddling technique of dragon boating was a challenge. A drummer helps the team members stay in sync. Coach Jordan Smallwood said even though some members of the team have a disability, they will be serious contenders in the competition this weekend. "There are a lot of teams that can't stay in stroke and they can see just fine," he said. Paul has a genetic condition called Stargardt disease, which causes people to lose their central vision, leaving only their peripheral vision. Paul, who is 64, started losing his sight around age 20. The team's name is a pun on the colloquial name for sandflies. Bryana, a biologist with the City of Winnipeg, came up with the name. The competition raises money for the Dream Factory, which gives kids with life-threatening illnesses experiences they might never get a chance to have otherwise.